Chicago—Sept. 30, 2003—Leaders at Illinois Institute of Technology (IIT) today joined with officials from the McCormick Tribune Foundation and the Office for Metropolitan Architecture (OMA) to dedicate The McCormick Tribune Campus Center. The much-anticipated building, designed by Dutch architect and Pritzker Prize laureate Rem Koolhaas, marks the culmination of five years of planning and construction on the historic Mies van der Rohe-designed IIT Main Campus. It is Koolhaas’ and OMA’s first completed building in North America. The $48.2 million Campus Center includes two primary components: a 110,000-square-foot, one-story building to serve a wide variety of student activity functions; and a 530-foot-long stainless steel clad tube that sits directly above the building’s roof, designed to significantly muffle the noise and vibration generated by passing Chicago Transit Authority commuter trains. The complex forms a new nexus for the academic and residential corridors of IIT’s Main Campus, approximately four miles south of Chicago’s Downtown Loop. Koolhaas’ interior layout for the building was inspired by pre-existing footpaths that criss-crossed under the train tracks, formed by students walking back and forth between residence halls and classroom buildings on the IIT Main Campus during the past 70 years. The Campus Center complex – from conception to completion – brought together three of the world’s leading innovators: IIT, a 113-year-old private, Ph.D.-granting university with programs in engineering, mathematics, science, psychology, architecture, business, design and law; OMA, considered one of the world’s top architecture and design firms; and the McCormick Tribune Foundation, one of the nation’s largest philanthropic foundations, which provided $13 million in funding for the project. Inside, the Campus Center boasts an array of architectural and design innovations not seen anywhere in the world: transparent and opaque glass walls, unique floor and ceiling finishes, customized graphic elements and a contoured, concrete roof to accommodate the bottom of the cylindrical tube. 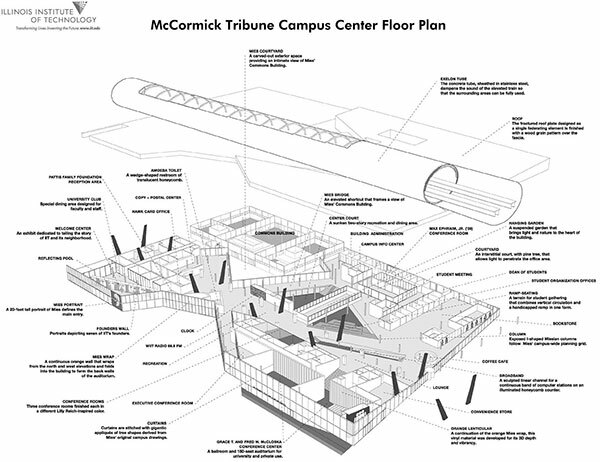 Dining facilities, auditorium and meeting rooms, student organization offices, the campus bookstore, a coffee bar, a post office and a convenience store will all be located in The McCormick Tribune Campus Center, unifying in one building functions that had been scattered in several Main Campus buildings. The new building also embraces the old; uniquely connecting itself to the Mies-designed Commons Building, which is being fully restored to be used as a central dining hall for the student residences. The tube, the predominate feature atop the building, was an integral component of Koolhaas’ design for The McCormick Tribune Campus Center, which won the Richard H. Driehaus Foundation International Design Competition in 1998. The building’s unique architecture also makes an explicit statement about IIT’s commitment to investment in the ongoing resurgence of Chicago’s Near South Side. The new Campus Center is the latest in a series of high profile building projects in Bronzeville, Chinatown, Bridgeport and U.S. Cellular Field. In July 2003, IIT opened the new State Street Village student residence hall, designed by award-winning Chicago architect Helmut Jahn. State Street Village and The McCormick Tribune Campus Center are the first new buildings to be constructed on the IIT Main Campus in nearly 40 years. 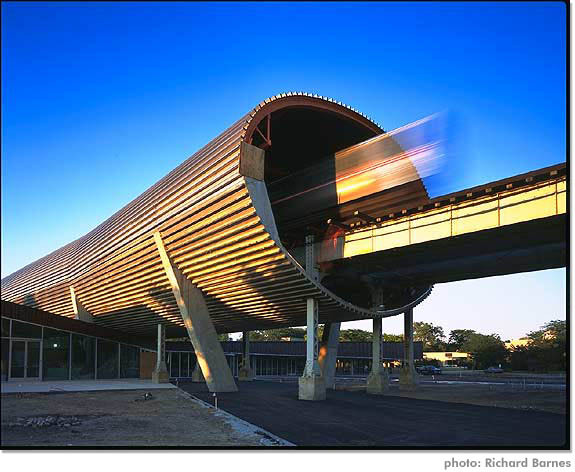 Both buildings are part of IIT’s Main Campus Master Plan, which received the prestigious 2003 Burnham Award from Chicago’s Metropolitan Planning Council for excellence in planning. Other aspects of the Master Plan include a recently launched revitalization of Mies van der Rohe campus buildings. Founded in 1890, IIT is a Ph.D.-granting technological university awarding degrees in the sciences, mathematics and engineering, as well as architecture, psychology, design, business and law. IIT’s interprofessional, technology-focused curriculum prepares the university’s 6,200 students for leadership roles in an increasingly complex and culturally diverse global workplace.